A strong aftershock struck Chile on Sunday, a day after a destructive 8.8-magnitude earthquake left hundreds of people dead and a long swath of the country in smoky rubble. The death toll was expected to rise, particularly around Concepción, Chile’s second-largest metropolitan area, which is roughly 70 miles from the quake’s center. The aftershock was reported around 8:30 local time Sunday morning from the capital of Santiago, where it shook buildings, according to Reuters. More than 1.5 million people have displaced by the quake, according to local news services that quoted the director of Chile’s emergency management office. 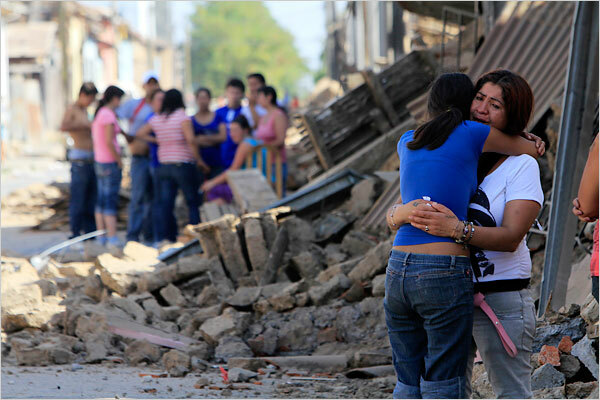 In Concepción, which appeared to be especially hard hit, the mayor said Sunday morning that 100 people were trapped under the rubble of a building that had collapsed, according to Reuters. Elsewhere in Concepción, cars lay mangled and upended on streets littered with telephone wires and power cables. A new 14-story apartment building fell, while an older, biochemical lab at the University of Concepción caught fire. In the nearby port of Talcahuano, a giant wave flooded the main square before receding and leaving behind a large fishing boat on the city streets. While this earthquake was far stronger than the 7.0-magnitude one that ravaged Haiti six weeks ago, the damage and death toll in Chile are likely to be far less extensive, in part because of strict building codes put in place after devastating earthquakes. The quake Saturday, tied for the fifth largest in the world since 1900, set off tsunami waves that swamped some nearby islands before moving across the Pacific. Hawaii began evacuations before dawn, but by early afternoon there — more than 15 hours after the earthquake first struck 6,500 miles away — the fears of a destructive wave had passed. Countries including Japan and the Philippines were on alert and ordered limited evacuations in anticipation of waves hitting Sunday.